, the Google Checkout store gadget, available in Google Labs, allows you to create an online store with inventory managed from a Google spreadsheet and payments accepted through Google Checkout. Today, using Google Docs and Checkout to sell online became easier with the introduction of a new store gadget wizard. Interesting in learning more about the store gadget wizard? Check out the post on the Google Checkout Blog. As you may recall, the Google Checkout store gadget, available in Google Labs, allows you to create an online store with inventory managed from a Google spreadsheet and payments accepted through Google Checkout. 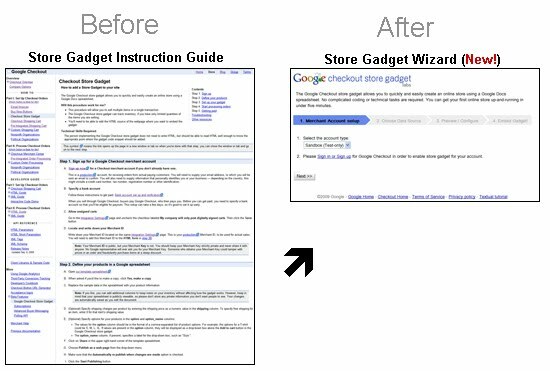 Today, using Google Docs and Checkout to sell online became easier with the introduction of a new store gadget wizard.